Quality medical care for older Americans needs to be about more than blood pressure, blood sugar and boxes checked during a physical exam, according to Laurence M. Solberg, M.D, chief of the University of Florida College of Medicine’s division of geriatric medicine. All are critically important, to be sure. But Solberg said health systems such as UF Health are increasingly recognizing the emotional component essential to healing and successful aging. So, UF Health geriatrics has added a clinical geropsychologist to work alongside geriatricians to better address the mental health needs of patients 65 years and older as well as their caregivers. This effort is part of a wider “age-friendly health care system” initiative spearheaded by Solberg to mark UF Health geriatrics as a destination for excellence in the care of older people. Psychologist Benjamin A. Bensadon, Ph.D., Ed.M., who recently joined UF Health from the Schmidt College of Medicine at Florida Atlantic University, is seeing patients at the UF Health Senior Care Clinic – Springhill and on a consulting basis elsewhere at UF Health. 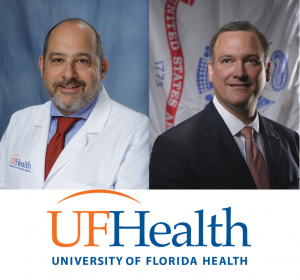 Solberg said Bensadon’s duties will eventually expand to UF Health internal and family medicine practices. Bensadon, an associate professor in the UF College of Medicine’s department of aging and geriatric research, said he seeks to help patients with depression, anxiety or other challenges and make them more confident in their medical decision-making. He will also counsel patients with cognitive impairment and other chronic conditions. He noted he is integrated with the clinical care team, closely collaborating with geriatricians. Solberg has worked with the Institute of Healthcare Improvement on an initiative designating UF Health as an age-friendly health care system. The designation means that UF Health geriatrics is committed to focusing care on core principles for successful aging, such as avoiding the overmedication of patients and increasing safe mobility, in addition to preventing, identifying, treating and managing cognitive issues such as depression and delirium. Critical to that initiative is aligning care with a patient’s life and health goals, and the addition of a geropsychologist plays a critical part in this, Solberg said. All older adults seen at the UF Health Senior Care Clinic – Springhill, UF Health Family Medicine – Springhill and UF Health Internal Medicine – Springhill, for example, are now asked what matters most to them in their care. The answer may be as simple as being able to play with their grandkids or sitting out in the fresh air. Solberg, who is also affiliated with the UF Institute on Aging, noted that one area of focus for Bensadon will be the psychological toll on patient caregivers — the spouses or children facing the strain of caring for a loved one who might, for example, be battling dementia. Benjamin A Bensadon, Ed. M, Ph.D.